Web 2.0 (also known as Participative (or Participatory) and Social Web) refers to websites that emphasize user-generated content, ease of use, participatory culture and interoperability (i.e., compatible with other products, systems, and devices) for end users. The term was invented by Darcy DiNucci in 1999 and later popularized by Tim O'Reilly and Dale Dougherty at the O'Reilly Media Web 2.0 Conference in late 2004. The Web 2.0 framework only specifies the design and use of websites and does not place any technical demands or specifications on designers. The transition was gradual and, therefore, no precise date for when this change happened has been given. A Web 2.0 website allows users to interact and collaborate with each other through social media dialogue as creators of user-generated content in a virtual community. This contrasts the first generation of Web 1.0-era websites where people were limited to viewing content in a passive manner. Examples of Web 2.0 features include social networking sites or social media sites (e.g., Facebook), blogs, wikis, folksonomies ("tagging" keywords on websites and links), video sharing sites (e.g., YouTube), hosted services, Web applications ("apps"), collaborative consumption platforms, and mashup applications. Whether Web 2.0 is substantially different from prior Web technologies has been challenged by World Wide Web inventor Tim Berners-Lee, who describes the term as jargon. His original vision of the Web was "a collaborative medium, a place where we [could] all meet and read and write." On the other hand, the term Semantic Web (sometimes referred to as Web 3.0) was coined by Berners-Lee to refer to a web of content where the meaning can be processed by machines. Web 1.0 is a retronym referring to the first stage of the World Wide Web's evolution. According to Cormode and Krishnamurthy, "content creators were few in Web 1.0 with the vast majority of users simply acting as consumers of content." Personal web pages were common, consisting mainly of static pages hosted on ISP-run web servers, or on free web hosting services such as GeoCities. With Web 2.0, it became common for average web users to have social-networking profiles (on sites such as Myspace and Facebook) and personal blogs through either a low-cost web hosting service or through a dedicated host (like Blogger or LiveJournal). In general, content was generated dynamically, allowing readers to comment directly on pages in a way that was not common previously. move from personal websites to blogs and blog site aggregation, from publishing to participation, from web content as the outcome of large up-front investment to an ongoing and interactive process, and from content management systems to links based on "tagging" website content using keywords (folksonomy). Flew believed these factors formed the trends that resulted in the onset of the Web 2.0 "craze". Content provided from the server's filesystem instead of a relational database management system (RDBMS). Writing when Palm Inc. introduced its first web-capable personal digital assistant (supporting Web access with WAP) DiNucci saw the Web "fragmenting" into a future that extended beyond the browser/PC combination it was identified with. She focused on how the basic information structure and hyperlinking mechanism introduced by HTTP would be used by a variety of devices and platforms. As such, her "2.0" designation refers to the next version of the Web that does not directly relate to the term's current use. In short, Netscape focused on creating software, releasing updates and bug fixes, and distributing it to the end users. O'Reilly contrasted this with Google, a company that did not, at the time, focus on producing end-user software, but instead on providing a service based on data such as, the links that Web page authors make between sites. Google exploits this user-generated content to offer Web searches based on reputation through its "PageRank" algorithm. Unlike software, which undergoes scheduled releases, such services are constantly updated, a process called "the perpetual beta". A similar difference can be seen between the Encyclopædia Britannica Online and Wikipedia: while the Britannica relies upon experts to write articles and release them periodically in publications, Wikipedia relies on trust in (sometimes anonymous) community members to constantly write and edit content. Wikipedia editors are not required to have educational credentials, such as degrees, in the subjects in which they are editing. Wikipedia is not based on subject-matter expertise, but rather on an adaptation of the open source software adage "given enough eyeballs, all bugs are shallow". This maxim is stating that if enough users are able to look at a software product's code (or a website), then these users will be able to fix any "bugs" or other problems. Wikipedia's volunteer editor community produces, edits and updates articles constantly. O'Reilly's Web 2.0 conferences have been held every year since 2004, attracting entrepreneurs, representatives from large companies, tech experts and technology reporters. Instead of merely reading a Web 2.0 site, a user is invited to contribute to the site's content by commenting on published articles, or creating a user account or profile on the site, which may enable increased participation. By increasing emphasis on these already-extant capabilities, they encourage users to rely more on their browser for user interface, application software ("apps") and file storage facilities. This has been called "network as platform" computing. Major features of Web 2.0 include social networking websites, self-publishing platforms (e.g., WordPress' easy-to-use blog and website creation tools), "tagging" (which enables users to label websites, videos or photos in some fashion), "like" buttons (which enable a user to indicate that they are pleased by online content), and social bookmarking. Users can provide the data and exercise some control over what they share on a Web 2.0 site. These sites may have an "architecture of participation" that encourages users to add value to the application as they use it. Users can add value in many ways, such as by commenting on news stories on a news website, by uploading a relevant photo on a travel website, or by adding a link to a video or TED talk which is pertinent to the subject being discussed on a website. Some scholars argue that cloud computing is an example of Web 2.0 because it is simply an implication of computing on the Internet. Edit box interface through which anyone could edit a Wikipedia article. A list of ways that people can volunteer to improve Mass Effect Wiki, an example of content generated by users working collaboratively. As such, Web 2.0 draws together the capabilities of client- and server-side software, content syndication and the use of network protocols. Standards-oriented Web browsers may use plug-ins and software extensions to handle the content and user interactions. Web 2.0 sites provide users with information storage, creation, and dissemination capabilities that were not possible in the environment known as "Web 1.0". Categorization of content by users adding "tags" — short, usually one-word or two-word descriptions — to facilitate searching. For example, a user can tag a metal song as "death metal". Collections of tags created by many users within a single system may be referred to as "folksonomies" (i.e., folk taxonomies). Here, Miller links Web 2.0 technologies and the culture of participation that they engender to the field of library science, supporting his claim that there is now a "Library 2.0". Many of the other proponents of new 2.0s mentioned here use similar methods. The meaning of Web 2.0 is role dependent. For example, some use Web 2.0 to establish and maintain relationships through social networks, while some marketing managers might use this promising technology to "end-run traditionally unresponsive I.T. department[s]." There is a debate over the use of Web 2.0 technologies in mainstream education. Issues under consideration include the understanding of students' different learning modes; the conflicts between ideas entrenched in informal online communities and educational establishments' views on the production and authentication of 'formal' knowledge; and questions about privacy, plagiarism, shared authorship and the ownership of knowledge and information produced and/or published on line. Web 2.0 is used by companies, non-profit organisations and governments for interactive marketing. A growing number of marketers are using Web 2.0 tools to collaborate with consumers on product development, customer service enhancement, product or service improvement and promotion. Companies can use Web 2.0 tools to improve collaboration with both its business partners and consumers. Among other things, company employees have created wikis—Web sites that allow users to add, delete, and edit content — to list answers to frequently asked questions about each product, and consumers have added significant contributions. Another marketing Web 2.0 lure is to make sure consumers can use the online community to network among themselves on topics of their own choosing. Mainstream media usage of Web 2.0 is increasing. Saturating media hubs—like The New York Times, PC Magazine and Business Week — with links to popular new Web sites and services, is critical to achieving the threshold for mass adoption of those services. User web content can be used to gauge consumer satisfaction. In a recent article for Bank Technology News, Shane Kite describes how Citigroup's Global Transaction Services unit monitors social media outlets to address customer issues and improve products. According to Google Timeline, the term Web 2.0 was discussed and indexed most frequently in 2005, 2007 and 2008. Its average use is continuously declining by 2–4% per quarter since April 2008. In tourism industries, social media is an effective channel to attract travellers and promote tourism products and services by engaging with customers. The brand of tourist destinations can be built through marketing campaigns on social media and by engaging with customers. For example, the “Snow at First Sight” campaign launched by the State of Colorado aimed to bring brand awareness to Colorado as a winter destination. The campaign used social media platforms, for example, Facebook and Twitter, to promote this competition, and requested the participants to share experiences, pictures and videos on social media platforms. As a result, Colorado enhanced their image as a winter destination and created a campaign worth about $2.9 million. The tourism organisation can earn brand royalty from interactive marketing campaigns on social media with engaging passive communication tactics. For example, “Moms” advisors of the Walt Disney World are responsible for offering suggestions and replying to questions about the family trips at Walt Disney World. Due to its characteristic of expertise in Disney, “Moms” was chosen to represent the campaign. Social networking sites, such as Facebook, can be used as a platform for providing detailed information about the marketing campaign, as well as real-time online communication with customers. Korean Airline Tour created and maintained a relationship with customers by using Facebook for individual communication purposes. Travel 2.0 refers a model of Web 2.0 on tourism industries which provides virtual travel communities. The travel 2.0 model allows users to create their own content and exchange their words through globally interactive features on websites. The users also can contribute their experiences, images and suggestions regarding their trips through online travel communities. For example, TripAdvisor is an online travel community which enables user to rate and share autonomously their reviews and feedback on hotels and tourist destinations. Non pre-associate users can interact socially and communicate through discussion forums on Tripadvisor. Social media, especially Travel 2.0 websites, plays a crucial role in decision-making behaviours of travellers. The user-generated content on social media tools have a significant impact on travellers choices and organisation preferences. Travel 2.0 sparked radical change in receiving information methods for travellers, from business-to-customer marketing into peer-to-peer reviews. User-generated content became a vital tool for helping a number of travellers manage their international travels, especially for first time visitors. The travellers tend to trust and rely on peer-to-peer reviews and virtual communications on social media rather than the information provided by travel suppliers. In addition, An autonomous review feature on social media would help travellers reduce risks and uncertainties before the purchasing stages. Social media is also a channel for customer complaints and negative feedback which can damage images and reputations of organisations and destinations. For example, a majority of UK travellers read customer reviews before booking hotels, these hotels receiving negative feedback would be refrained by half of customers. Therefore, the organisations should develop strategic plans to handle and manage the negative feedback on social media. Although the user-generated content and rating systems on social media are out of a businesses controls, the business can monitor those conversations and participate in communities to enhance customer loyalty and maintain customer relationships. Ajax has prompted the development of Web sites that mimic desktop applications, such as word processing, the spreadsheet, and slide-show presentation. WYSIWYG wiki and blogging sites replicate many features of PC authoring applications. Several browser-based services have emerged, including EyeOS and YouOS. (No longer active.) Although named operating systems, many of these services are application platforms. They mimic the user experience of desktop operating systems, offering features and applications similar to a PC environment, and are able to run within any modern browser. However, these so-called "operating systems" do not directly control the hardware on the client's computer. Numerous web-based application services appeared during the dot-com bubble of 1997–2001 and then vanished, having failed to gain a critical mass of customers. In terms of Web 2.0's social impact, critics such as Andrew Keen argue that Web 2.0 has created a cult of digital narcissism and amateurism, which undermines the notion of expertise by allowing anybody, anywhere to share and place undue value upon their own opinions about any subject and post any kind of content, regardless of their actual talent, knowledge, credentials, biases or possible hidden agendas. Keen's 2007 book, Cult of the Amateur, argues that the core assumption of Web 2.0, that all opinions and user-generated content are equally valuable and relevant, is misguided. Additionally, Sunday Times reviewer John Flintoff has characterized Web 2.0 as "creating an endless digital forest of mediocrity: uninformed political commentary, unseemly home videos, embarrassingly amateurish music, unreadable poems, essays and novels... [and that Wikipedia is full of] mistakes, half-truths and misunderstandings". In a 1994 Wired interview, Steve Jobs, forecasting the future development of the web for personal publishing, said "The Web is great because that person can't foist anything on you-you have to go get it. They can make themselves available, but if nobody wants to look at their site, that's fine. To be honest, most people who have something to say get published now." Michael Gorman, former president of the American Library Association has been vocal about his opposition to Web 2.0 due to the lack of expertise that it outwardly claims, though he believes that there is hope for the future. In November 2004, CMP Media applied to the USPTO for a service mark on the use of the term "WEB 2.0" for live events. On the basis of this application, CMP Media sent a cease-and-desist demand to the Irish non-profit organisation IT@Cork on May 24, 2006, but retracted it two days later. The "WEB 2.0" service mark registration passed final PTO Examining Attorney review on May 10, 2006, and was registered on June 27, 2006. The European Union application (which would confer unambiguous status in Ireland) was declined on May 23, 2007. ^ Blank, Grant; Reisdorf, Bianca (2012-05-01). "The Participatory Web". Information. 15 (4): 537–554. doi:10.1080/1369118X.2012.665935. ^ a b "What is Web 1.0? - Definition from Techopedia". Techopedia.com. Retrieved 2018-07-13. ^ a b Graham, Paul (November 2005). "Web 2.0". Retrieved 2006-08-02. I first heard the phrase 'Web 2.0' in the name of the Web 2.0 conference in 2004. ^ a b c d O'Reilly, Tim (2005-09-30). "What Is Web 2.0". O'Reilly Network. Retrieved 2006-08-06. ^ Strickland, Jonathan (2007-12-28). "How Web 2.0 Works". computer.howstuffworks.com. Retrieved 2015-02-28. ^ a b DiNucci, Darcy (1999). "Fragmented Future" (PDF). Print. 53 (4): 32. ^ a b c "DeveloperWorks Interviews: Tim Berners-Lee". 2006-07-28. Retrieved 2012-08-05. ^ "Berners-Lee on the read/write web". BBC News. 2005-08-09. Retrieved 2012-08-05. ^ Richardson, Will (2009). Blogs, Wikis, Podcasts, and Other Powerful Web Tools for Classrooms (2nd ed.). California: Corwin Press. p. 1. ISBN 978-1-4129-5972-8. ^ "What is Web 3.0? Webopedia Definition". www.webopedia.com. Retrieved 2017-02-15. ^ Berners-Lee, Tim; James Hendler; Ora Lassila (May 17, 2001). "The Semantic Web" (PDF). Scientific American. Retrieved October 1, 2018. ^ Balachander Krishnamurthy, Graham Cormode (2 June 2008). "Key differences between Web 1.0 and Web 2.0". First Monday. 13 (6). ^ "Geocities - Dead Media Archive". cultureandcommunication.org. ^ "So Long, GeoCities: We Forgot You Still Existed". 2009-04-23. ^ Flew, Terry (2008). New Media: An Introduction (3rd ed.). Melbourne: Oxford University Press. p. 19. ^ Viswanathan, Ganesh; Dutt Mathur, Punit; Yammiyavar, Pradeep (March 2010). "From Web 1.0 to Web 2.0 and beyond: Reviewing usability heuristic criteria taking music sites as case studies". IndiaHCI Conference. Mumbai. Retrieved 20 February 2015. ^ "Is there a Web 1.0?". HowStuffWorks. January 28, 2008. ^ "The Right Size of Software". www.catb.org. ^ a b Knorr, Eric. 2003. The year of Web services. CIO, December 15. ^ a b O'Reilly, Tim, and John Battelle. 2004. Opening Welcome: State of the Internet Industry. In San Francisco, California, October 5. ^ Hinchcliffe, Dion (2006-04-02). "The State of Web 2.0". Web Services. Archived from the original on 2007-05-15. Retrieved 2006-08-06. ^ [SSRN: http://ssrn.com/abstract=732483 Wireless Communications and Computing at a Crossroads: New Paradigms and Their Impact on Theories Governing the Public's Right to Spectrum Access], Patrick S. Ryan, Journal on Telecommunications & High Technology Law, Vol. 3, No. 2, p. 239, 2005. ^ Pal, Surendra Kumar. "Learn More About Web 2.0". academia.edu. Retrieved 2015-10-14. ^ Greenmeier, Larry & Gaudin, Sharon. "Amid The Rush To Web 2.0, Some Words Of Warning – Web 2.0 – InformationWeek". www.informationweek.com. Retrieved 2008-04-04. ^ "What Is Web 2.0". oreilly.com. ^ McAfee, A. (2006). Enterprise 2.0: The Dawn of Emergent Collaboration. MIT Sloan Management review. Vol. 47, No. 3, p. 21–28. ^ Hinchcliffe, Dion (November 5, 2006). "Web 2.0 definition updated and Enterprise 2.0 emerges". ZDNet blogs. Archived from the original on 2006-11-29. ^ Lewoniewski, Włodzimierz (2019-01-03). "Measures for Quality Assessment of Articles and Infoboxes in Multilingual Wikipedia". Lecture Notes in Business Information Processing. 339: 619–633. doi:10.1007/978-3-030-04849-5_53. ^ Schick, S., 2005. I second that emotion. IT Business.ca (Canada). ^ Singer, Jonathan B. (2009). The Role and Regulations for Technology in Social Work Practice and E-Therapy: Social Work 2.0. In A. R. Roberts (Ed). New York, U.S.A.: Oxford University Press. ISBN 978-0-19-536937-3. ^ Breakenridge, D., 2008. PR 2.0: New Media, New Tools, New Audiences 1st ed., FT Press. ^ "Classroom 2.0". Retrieved 2010-09-22. ^ Karp, Scott. "Publishing 2.0". Publishing2.com. Retrieved 2011-02-06. ^ Eggers, William D. (2005). Government 2.0: Using Technology to Improve Education, Cut Red Tape, Reduce Gridlock, and Enhance Democracy. Lanham MD, U.S.A.: Rowman & Littlefield Publishers, Inc. ISBN 978-0-7425-4175-7. Archived from the original on 2009-02-17. ^ Rusak, Sergey (2009). Web 2.0 Becoming An Outdated Term. Boston, Massachusetts, U.S.A.: Progressive Advertiser. Archived from the original on March 3, 2010. ^ "i-Technology Viewpoint: It's Time to Take the Quotation Marks Off "Web 2.0" | Web 2.0 Journal". Web2.sys-con.com. Retrieved 2011-02-06. ^ Anderson, Paul (2007). 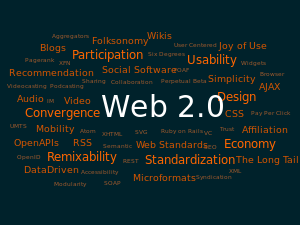 "What is Web 2.0? Ideas, technologies and implications for education". JISC Technology and Standards Watch. CiteSeerX 10.1.1.108.9995. ^ Parise, Salvatore (2008-12-16). "The Secrets of Marketing in a Web 2.0 World". The Wall Street Journal. ^ MacManus, Richard (2007). "Mainstream Media Usage of Web 2.0 Services is Increasing". Read Write Web. Archived from the original on 2011-08-11. ^ "Banks use Web 2.0 to increase customer retention". PNT Marketing Services. 2010. ^ Mukherje, Anwesha (June 2016). "Role of Social Media in Tourism Marketing". International Journal of Science and Research (IJSR). 5: 2026–2033. ^ a b c Hudson, Simon; Thal, Karen (2013-01-01). "The Impact of Social Media on the Consumer Decision Process: Implications for Tourism Marketing". Journal of Travel & Tourism Marketing. 30 (1–2): 156–160. doi:10.1080/10548408.2013.751276. ISSN 1054-8408. ^ Park, Jongpil; Oh, Ick-Keun (2012-01-01). "A Case Study of Social Media Marketing by Travel Agency: The Salience of Social Media Marketing in the Tourism Industry". International Journal of Tourism Sciences. 12 (1): 93–106. doi:10.1080/15980634.2012.11434654. ISSN 1598-0634. ^ a b Buhalis, Dimitrios; Law, Rob (2008). "Progress in information technology and tourism management: 20 years on and 10 years after the Internet—The state of eTourism research". Tourism Management. 29 (4): 609–623. doi:10.1016/j.tourman.2008.01.005. ^ Milano, Roberta; Baggio, Rodolfo; Piattelli, Robert (2011-01-01). "The effects of online social media on tourism websites". Information and Communication Technologies in Tourism 2011. Springer, Vienna. pp. 471–483. CiteSeerX 10.1.1.454.3557. doi:10.1007/978-3-7091-0503-0_38. ISBN 978-3-7091-0502-3. ^ a b Miguens, J.; Baggio, R. (2008). "Social media and Tourism Destinations: TripAdvisor Case Study" (PDF). Advances in Tourism Research: 26–28. ^ a b c d Zeng, Benxiang; Gerritsen, Rolf (2014-04-01). "What do we know about social media in tourism? A review". Tourism Management Perspectives. 10: 27–36. doi:10.1016/j.tmp.2014.01.001. ^ Richardson, Will (2010). Blogs, Wikis, Podcasts, and Other Powerful Web Tools for Classrooms. Corwin Press. p. 171. ISBN 978-1-4129-7747-0. ^ "Can eyeOS Succeed Where Desktop.com Failed?". www.techcrunch.com. Retrieved 2007-12-12. ^ "Tech Beat Hey YouOS! – BusinessWeek". www.businessweek.com. Retrieved 2007-12-12. ^ O'Reilly, Tim (2002-06-18). "Amazon Web Services API". O'Reilly Network. Archived from the original on 2006-06-13. Retrieved 2006-05-27. ^ "Tim Berners-Lee on Web 2.0: "nobody even knows what it means"". September 2006. He's big on blogs and wikis, and has nothing but good things to say about AJAX, but Berners-Lee faults the term "Web 2.0" for lacking any coherent meaning. ^ "developerWorks Interviews: Tim Berners-Lee". 2006-08-22. ^ "Bubble 2.0". The Economist. 2005-12-22. Retrieved 2006-12-20. ^ Flintoff, JohnPaul (2007-06-03). "Thinking is so over". The Times. London. ^ Wolf, Gary. "Steve Jobs: The Next Insanely Great Thing". Wired. ^ Gorman, Michael. "Web 2.0: The Sleep of Reason, Part 1". Retrieved 26 April 2011. ^ Terranova, Tiziana (2000). "Free Labor: Producing Culture for the Digital Economy". Social Text. 18 (2): 33–58. doi:10.1215/01642472-18-2_63-33. ^ Peterson, Soren (2008). "Loser Generated Content: From Participation to Exploitation". First Monday. 13 (3). Taylor, Astra (2014). The People's Platform: Taking Back Power and Culture in the Digital Age. Metropolitan Books. ISBN 9780805093568. ^ Gehl, Robert (2011). "The Archive and the Processor: The Internal Logic of Web 2.0". New Media and Society. 13 (8): 1228–1244. doi:10.1177/1461444811401735. ^ Andrejevic, Mark (2007). iSpy: Surveillance and Power in the Interactive Era. Lawrence, KS: U P of Kansas. ISBN 978-0-7006-1528-5. ^ Zittrain, Jonathan. "Minds for Sale". Berkman Center for the Internet and Society. Retrieved 13 April 2012. ^ "Accessibility in Web 2.0 technology". In the Web application domain, making static Web pages accessible is relatively easy. But for Web 2.0 technology, dynamic content and fancy visual effects can make accessibility testing very difficult. ^ "Web 2.0 and Accessibility". Archived from the original on 24 August 2014. Web 2.0 applications or websites are often very difficult to control by users with assistive technology. ^ Marwick, Alice (2010). "Status Update: Celebrity, publicity and Self-Branding in Web 2.0" (PDF). ^ Jarrett, Kylie (2008). "Interactivity Is Evil! A Critical Investigation of Web 2.0". First Monday. 13 (3). ^ a b "USPTO serial number 78322306". Tarr.uspto.gov. Retrieved 2011-02-06. ^ "O'Reilly and CMP Exercise Trademark on 'Web 2.0'". Slashdot. 2006-05-26. Retrieved 2006-05-27. ^ Torkington, Nathan (2006-05-26). "O'Reilly's coverage of Web 2.0 as a service mark". O'Reilly Radar. Archived from the original on 15 January 2008. Retrieved 2006-06-01. ^ "Application number 004972212". 2007. Web 2.0 / Social Media / Social Networks. Charleston, South Carolina, SUA: MultiMedia. 2017. ISBN 978-1-544-63831-7.